An early 19th century house with a rendered façade and a central Tuscan portico. The elaborate interior of the house includes a large ballroom with plaster decoration and a marble fireplace. In the grounds of the house is the grave of a horse that survived the Charge of the Light Brigade in 1854. The horse was bought back to England by a member of the Everard family, and ended its days on the estate. Large early 19th century building of 5 bays 3 storeys (top smaller). Visited by E. Rose (NAU), 18 June 1981. Built by Everard family. Stated to have ballroom, marble fireplaces and ornate ceilings etc. In grounds is grave of a horse which took part in the charge of the Light Brigade. E. Rose (NLA), 7 February 1985. (S2) dates hall to 1794 to 1800. For full details of the interior, and outbuildings, see (S3) showing that the interior is of considerable quality. Architects Plans and proposals (1991 and 1994) in file. --- Newspaper Article: 1988. Eastern Daily Press. 30 April. --- Newspaper Article: Lynn News. 1994. Lynn News. 20 May. <S1> Newspaper Article: 1985. Eastern Daily Press. 6 February. <S2> Unpublished document: Norfolk County Council. 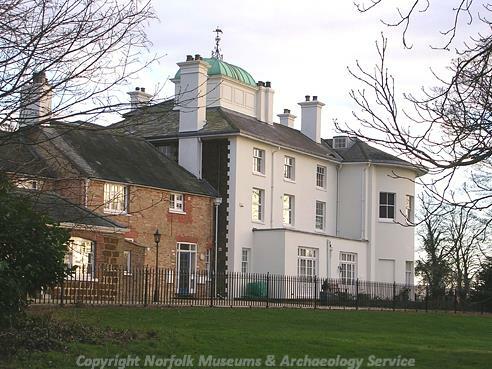 Inventory of Historic Parks and Gardens of Special Historic Interest in Norfolk..
<S3> Scheduling record: English Heritage. List of Buildings of Historical and Architectural Interest.